Love this! I agree with pretty much everything you said. After two years I'm just starting to see the one stars pop up, so what you said about 1 star reviews sounds about right. Finally being recognized so now the haters are showing up. 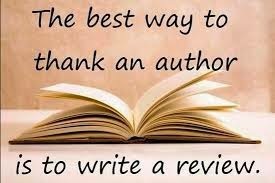 I also like to read all reviews, whether good or bad. Reading the one stars is like swallowing nails, but I do it anyway. Great post! great ideas to see what is going on and give yourself some of your own encouragement! I do think reviews can be helpful in figuring out what your readers want, but I find they often seem to be contradictory - one review can say the pacing was too slow, and another can say it was just right. It's impossible to please everyone! I read mine. I don't think I could stand knowing people had said stuff about my book and not know what it was. I try not to be objective about them though. It's hard to do sometimes, but I try. I love your definition of one-star reviews :) All reviews do prepare for criticism, though. It's impossible for everyone to agree on a book. It's definitely important to remember that a bad review does not mean a bad writer.